I've added ComputerCraft support as of Build 20! Thank you very much for this mod, I like it a lot. After last update it works on server too. Thank you author very much. You can totally do that, you just have to run a ShoutCast/IceCast server yourself and setup the Broadcaster tools to listen to your mic not a audio player. Awesome! I'm totally going to add this to my Unabridged modpack. I have a few requests though! I can also make the textures for these extra things if you want. Speakers are already a thing, though they're wireless. If you have OpenComputers the speakers will connect to OC cables, really just for aesthetics though. I've played around with this a bit now. Something I would like from this mod is a way to add some "presets" that the radio can tune into. Maybe using a "dial" block or something. The presets would be defined in a config file with json or whatever you prefer. This would allow modpack makers or server owners to set some default stations for players to be able to tune into. 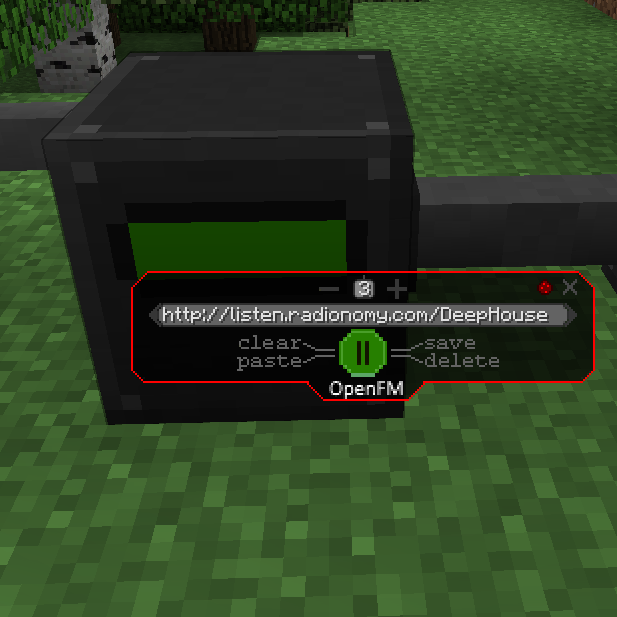 This is definitely the biggest feature I miss from the open blocks radios.